Step Away From the Cake: 191!!!!! So what it shows is that I've been u (because you tell it when you sleep) for about 3 1/2 hours. And I've taken 5,996 steps, gone 3.38 miles, and the pie chart shows that for 1 1/2 hours of that time I've been sedentary. That is my problem. 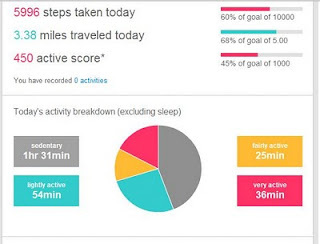 I regularly log 9-11 hours of day of sedentary time. That is very not cool. A large part of the problem is that I'm trying to write a thesis and that requires time sitting. Sitting reading. Sitting doing research. Sitting writing. I need to come up with a way to get this stuff done but be less sedentary. Don't ask me how I'm going to do that. I do know that I am going to track every little bite I eat. I'm sure I'm eating too much in spite of what I think. So every morsel gets tracked. Luckily Fitbit tracks your food too. Okay, I'm bummed, depressed, whatever you want to call it but something has to change and it has to change right now.